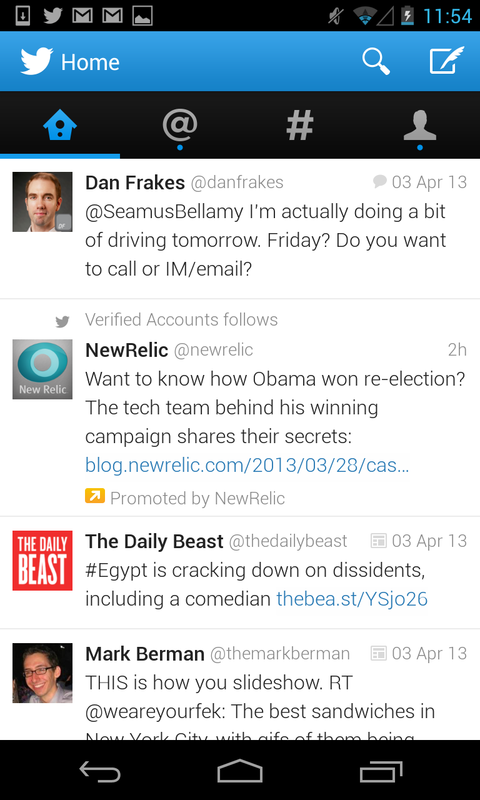 Twitter has updated its Android app as well as its iOS app today, both of which now support its new app install cards. 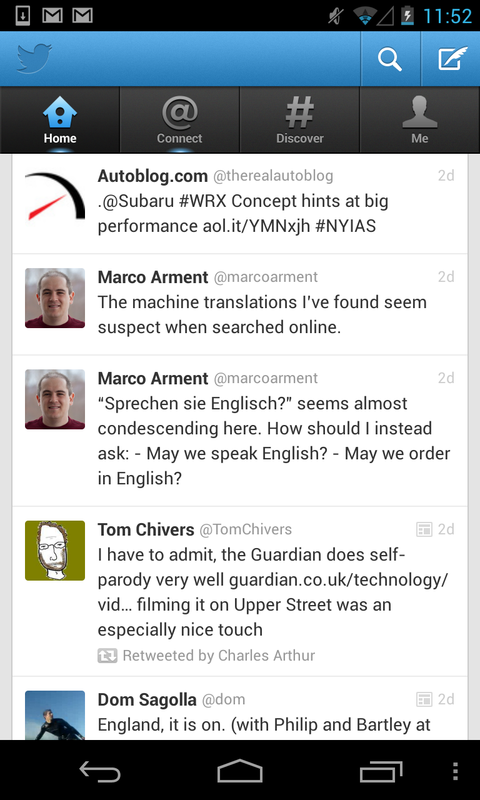 That’s only a portion of what the Android update brings, though, as it’s really a long overdue overhaul of the Twitter experience on Android. The Android app has lagged behind the iOS version in both looks and functionality for a while now, so it’s great to see it’s getting some love. One of the nicest improvements, in my book, is the fact that there is no longer an artificial ‘margin’ or border along the edges of the timeline. Tweets now span edge to edge and the timeline is taller overall. 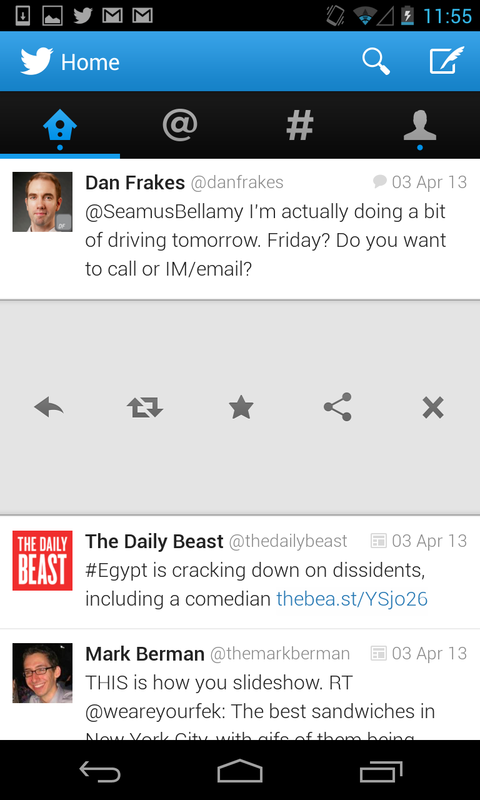 This is great, as tweets are the content, not empty, useless borders. Those borders, alas, remain on the latest iOS version. The new edition also brings a flat Android-Holo-esque navigation bar that does indeed feel more ‘native’ to the Android platform. The previous Twitter app looked like a mashup of its iOS and Web versions. This version looks a lot more like an ‘Android’ app. Several other Android conventions are also coming to the app in this edition, including tap-and-hold quick action menu that gives you access to favorites, retweets and more. Another cool addition is the ability to swipe between tabs by performing Android’s ‘edge swipe’ gesture. This allows for much quicker zipping between sections and I’d love to see it come to iOS, though it’s non-standard (aside from a couple of clever apps like Clear) there. A few more additions include automatic suggestions of usernames and hashtags, which was sorely missing before. Twitter also mentions that its Web app has been updated to support the new app install Cards. More on those and the iOS update here.